So all I know about this is we had an old DVD-rom drive. Old as in PATA old. Anyway, it was kinda dead - so I killed it more. With reckless abandon, I ripped out all the motors (all 3 of them - the tiny little brushless on the wormgear looked like that was the dead part of the drive as it was a little charred around the edges) and helped myself to whatever metal the casing is made of. So one of the motors, the disc tray open-close motor, is a bog standard brushed motor that spins away quite happily off a lipo. Not a clue how torquey or fast, but it spins. 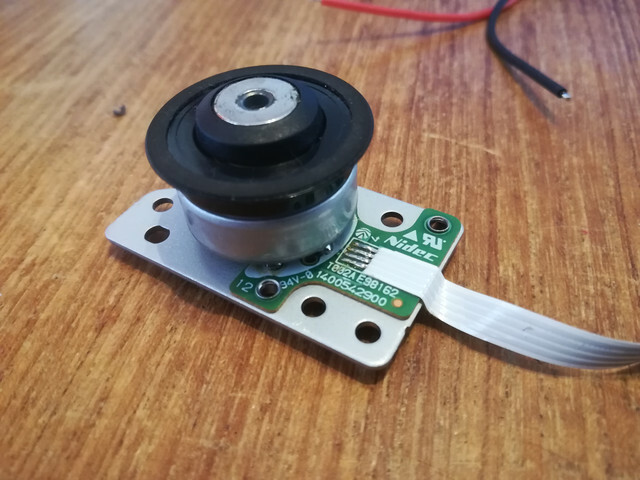 The disc-spin motor however is brushless. And has 4 wires. Why the heck does it have 4 wires? Anyway. Yeah. Does anyone have a clue what the 4th wire is all about? It is probably a brushless motor. I'm fairly sure that the 4th wire is a centre-point wire in the Y configuration of the brushless. There are lots of youtube videos of people running these things. There are some cheap speed controller boards you can get for testing purposes, which will run the motor from a DC supply.